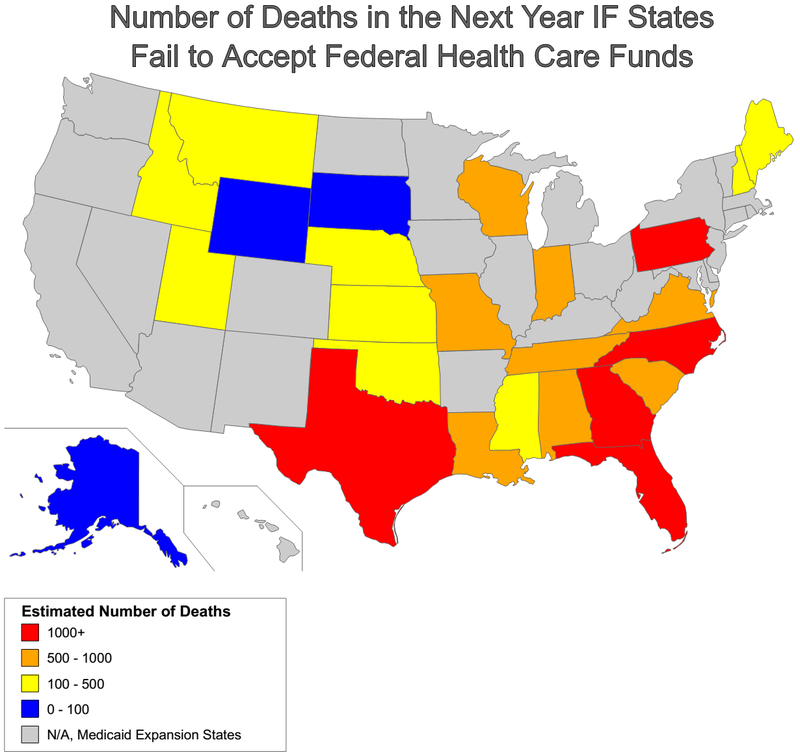 Health Affairs Blog published estimates of what the predicted consequences would be over the next year if state lawmakers refused federal matching funds to expand the Medicaid program so that more people would qualify. The deal is a generous one – federal funds would cover 100% of the cost of this expansion for the first three years and 90% afterwards. Medicaid expansion would mean making the program available for ALL people with incomes 138% of the federal poverty level or less. This would have translated into less than $20,000 a year for a family of three in 2013. States that have so far opted-out of Medicaid expansion programs are turning down billions of dollars of potential revenue. This revenue will ensure that more people will get the health care they need and would certainly provide a boost to local economies. Personal inspiration came from http://157mainers.com/. It is my hope that organizations fighting to expand health care access for low-income people make use of this map. I intentionally left plenty of white space in the lower right side for you to insert your custom message. Here is a downloadable version of this map in two different file-types. This is the first map I have created in years. It is a vector image written in SVG. Many thanks to Wikipedia user, Theshibboleth for the base map! Unlike many auto-generated SVG images, the base map was easily decipherable which gave me the courage to take my first steps with SVG.